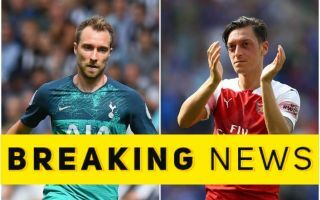 Manchester United are on alert as Mesut Ozil reportedly wants out of Arsenal after a bust-up with manager Unai Emery. The German playmaker was left on the bench against Bournemouth last weekend and didn’t even make the Gunners’ squad for the win over Tottenham this Sunday. This has led to Ozil considering his future at the Emirates Stadium, despite the official line from the club being that he had a problem with a back injury. With Arsenal unchanged against Tottenham from the team that beat Bournemouth, it seems that Ozil was indeed not in Emery’s plans for the North London Derby. This has placed United on red alert after manager Jose Mourinho tried to sign the 30-year-old for months last season. Mesut Ozil to Manchester United transfer saga back on? It took some time before Ozil eventually signed a new contract with Arsenal, but Arsene Wenger’s departure and the more hard-line stance of Emery has changed things for the player. It remains to be seen if the Red Devils can win the race for his signature, with other top sides set to be in for the player as well. Inter Milan are already being linked with Ozil, but the former Real Madrid man enjoyed some of the finest football of his career under Mourinho at the Bernabeu, so a reunion at Old Trafford could make sense. United are also in dire need of a creative player of his calibre as Juan Mata will be out of contract at the end of the season and the likes of Paul Pogba have struggled in recent times.